Summertime is a great time for neighborhood block parties. People barbecue food, there’s music and dancing, but that isn’t the case for one Boise, Idaho neighborhood. 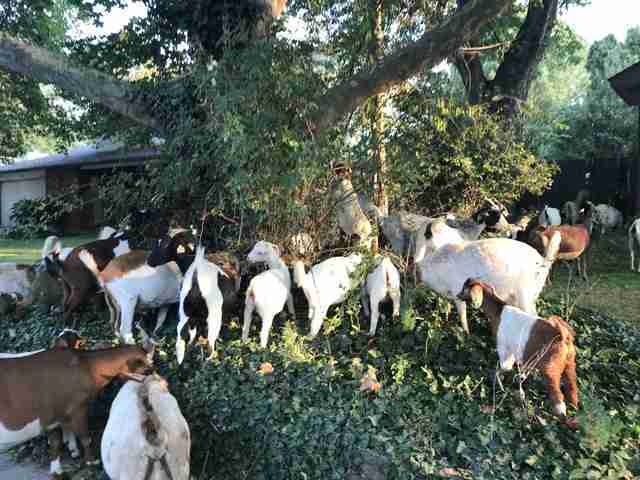 At 7 am, a herd of goats were seen eating neighbors flowerbeds, manicured grass, and trees. On Friday morning, this was the scene each neighbor woke up to. It is clear that the hooved gang was having the time of their lives munching on grass and nearby fauna. However, it is unclear as to where the herd of goats came from. They quickly roamed yard to yard munching on anything at mouth level. A random herd of goats owns the neighborhood now. Others seemed to wander through the streets, perusing which yard to go into next. Goats climbed into bushes, scaled trees and even walked right up to porches as the neighbors all watched in disbelief. Joe Parris, a local reporter with KTVB, snapped photos and videos of the scene. He even shared them on his Twitter account for the world to see. The “great goatscapade” went viral quickly. Local animal control officers arrived on the scene, realizing they were going to need a bigger truck to gather this herd. For nearly an hour the goats continued their fierce munching. Finally, the owners arrived. These goats have a passion for munching. As it turns out they were owned by a company called We Rent Goats. They bring in herds of goats to clear land by eating weeds and overgrown areas. As shown, they have a passion for eating. The night before, the herd of goats had been working on a tasty project nearby. Apparently, they had made a grand plan to run for it. Their fun party was over for now, and they were returned to their rightufl owners for their next gig. Which is probably what the goats were thinking too.